Is Liverpool the birthplace of the modern skyscraper? The building in the photo above is the Royal Liver Building, built in 1911, an icon of the English city of Liverpool and one of its most recognisable Liverpool attractions. And yes, indeed, in many ways it is at the heart of Liverpool’s foundations as the home of the skyscraper. You won’t see blistering Dubai-like skylines in Liverpool – actually, much of what is important is what you can’t see. Liverpool buildings were the first to use iron to actually support the structure itself. This was first accomplished in some of the city’s older churches before being put to use inside bigger buildings. Older taller buildings had small windows because the walls required the support. Not so in many Liverpool buildings, which were the first to have large glass windows as walls. The Royal Liver was indeed the first to use reinforced concrete to secure its height. Without it, some of the original tall concrete buildings looked a bit like the leaning tower of Pisa a bit too soon after construction! 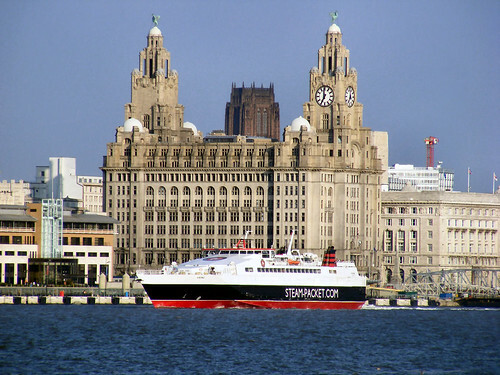 Pre-fabricated building sections were also first used in Liverpool. These were mostly used in the building of several apartment complexes throughout the city which weren’t architecturally stunning, but it did prove that this concept could increase building speed and reduce the cost. We’ve plenty of travel tips for what to do in England, outside London. This entry was posted in England, UK and tagged Liverpool on August 27, 2010 by Andy Hayes.